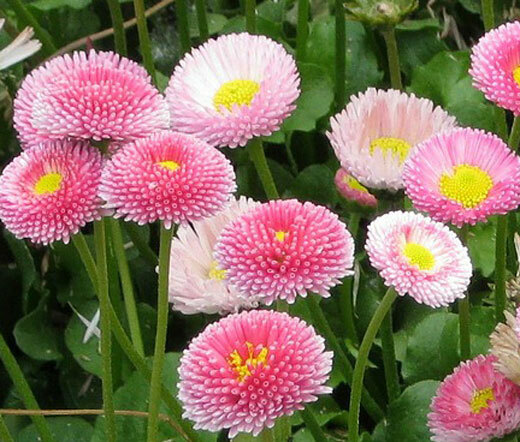 Daisy English Bellis Perennis is an evergreen, herbaceous perennial. Daisy English seeds can be started indoors or directly outdoors, and also commonly called Lawn Daisy and Bruisewort, English Daisy is a compact and low growing flowering plant that produces single or semi-double, daisy-like flowers with yellow centers and white, sometimes tinted with pink or rose petals. If conditions are right, English Daisy blooms throughout an entire season, and for the best blooms, the partial shade is preferable environment in warm, inland summer areas. Daisy English is used as a delightful edging plant and a superior companion plant for spring-flowering bulbs, and its the yellow-eyed, rose - white flowers will brighten up any border or rock garden. Because of its compact growth habit, Lawn Daisy is often grown as a ground cover or container plant. Bellis Perennis seeds produce a very adaptable and dependable perennial or biennial flower that can bloom from seed the first year if the seeds are started early. English Daisy likes any fertile soil but dislikes clay, and the plant may continually bloom in coastal climates re-seeding itself freely.